Day 4: Rappelling waterfalls. Hike to volcano base. Hot Springs. 6:00am You can see the volcano from our room! 8:45am Todd ate for the first time in more than 24 hours. Feels much better. Nice breakfast buffet at Tabacon’s restaurant. Walked down to the hot springs and saw howler monkeys playing in the trees on the way back. 2:30pm Guides picked us up at 9:00 and drove us to town. Took a “jungle limo” up the side of the mountain. Put on some climbing gear and hiked and rappelled down a series of waterfalls including one that is 210 feet! Really funny guide. Beautiful. A blast. And we got SOAKED. 6:30pm At the last minute we signed up for a 3:00 hike to the base of Arenal Volcano. Soooo great. Saw two baby pit vipers. A drop of venom could kill you and babies will hit you with all they have! Guide also found a taranchula and another spider with a web so strong its being studied by Nasa. You can pluck it like a violin string. He showed how a soldier ant can hold a tree branch by it’s jaws. We watched birds for awhile. Then we saw the full height of the volcano with clear skies which is very rare during rainy season. The view up there is spectacular. 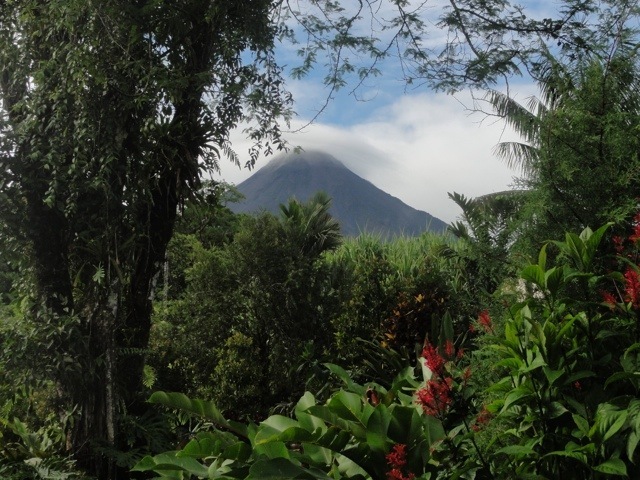 Volcano, jungle, hillsides, and Lake Arenal. Stunning sunset on the short drive back. Great trip. 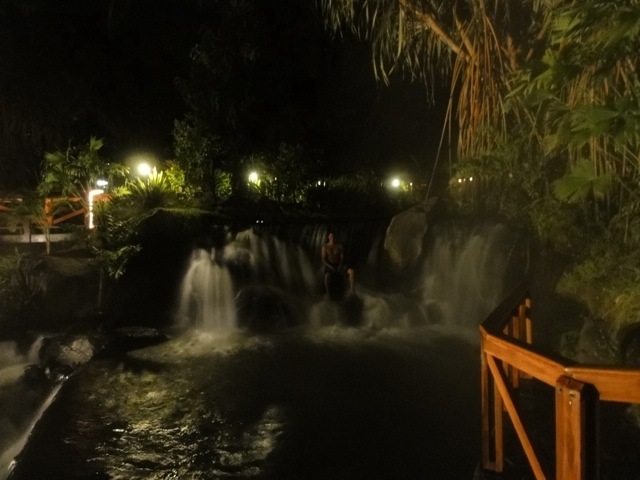 9:45pm Dinner at Lava Lounge downtown and then headed to Tabacon Hot Springs. Amazing area built up around part of the river that runs hot. Waterfalls everywhere gushing hot water. We were married in front of that volcano. Amazing isn’t it ?